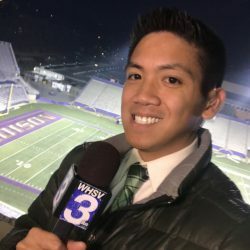 By David DeGuzman: Local Sports Anchor, Global Sports Follower. The Commonwealth Games Federation officially awarded the hosting rights to the 2022 Commonwealth Games to Durban, South Africa, marking the first time that the multi-sport festival will be held in the African continent. Durban was the sole bidder for the games after Edmonton, Canada withdrew earlier this year because of economic woes. The announcement was made at the Federation’s General Assembly in Auckland, New Zealand Wednesday. South Africa has already hosted the 1995 Rugby World Cup and more recently the 2010 FIFA World Cup. The 2022 Commonwealth Games are scheduled to begin on July 18 – the birthday of the late South African president Nelson Mandela. The next Commonwealth Games will take place in Gold Coast, Australia in 2018. On our way back from Columbia, SC and feeling incredibly #grateful for the opportunity to cover an #NCAATournament. To the people of #Columbia, you were wonderful and proud hosts. I’ll be back. Special thanks to friend and former colleague @claire_richardson92 for being a great tour guide. And happy to have shared this experience with @swaddelltv and @vwoo94! Fun navigating the halls of Colonial Life Arena with y’all. #UVa hoops has arrived in Columbia, SC! The Cavaliers will practice and speak to the media tomorrow ahead of Friday’s first round #NCAA game with Gardner-Webb.